The phone rang shortly after 7am. It was going to be a very hot day and Dave suggested a walk over Fairsnape, above Chipping, early on. I grabbed a drink and my camwera and we were soon climbing the old track up Saddle Fell with a lovely breeze keeping us cool. I can only surmise that this track was for sledging down peat from the cloughs above. Crossing a fence before the watershed the track has been ‘improved’ with stones and gives a good walking surface to the true summit of Fairsnape, 520m. The last few yards of bog have been paved with slabs though today everything was so dry one could walk anywhere. Taking out my camera to record the summit I found the battery completely flat hence no pictures to accompany this post. The above photo taken later from Longridge Fell shows Parlick and Fairsnape to the left with Saddle Fell central. Below is the village of Chipping and lower right you can see the Steam Fair site which is open all Spring Bank weekend and attracts visitors from far afield. The walk along the ridge was as dry as I have known it, we cut downhill before the trigpoint. Skylarks were singing and fluttering high above and several pairs of Curlews were flying past with their haunting call. A small brown bird flew up from under my feet and there in the heather was the most perfect round little nest lined with grass and containing four brownish eggs, probably Meadow Pipit. I cursed the lack of my camera. Skirting round the west side of Parlick we avoided the worst of the steep descent and contoured back under the fells to Saddle End and the car. We were back home for lunch before the hottest part of the day. Only the next day did I discover a tick embedded in my groin which I quickly and cleanly removed with my extracting device. These little menaces seem to be becoming more common in sheep rearing areas and as they have the potential to carry Lymes Disease care should be taken to avoid them. I was asking for trouble walking in shorts. 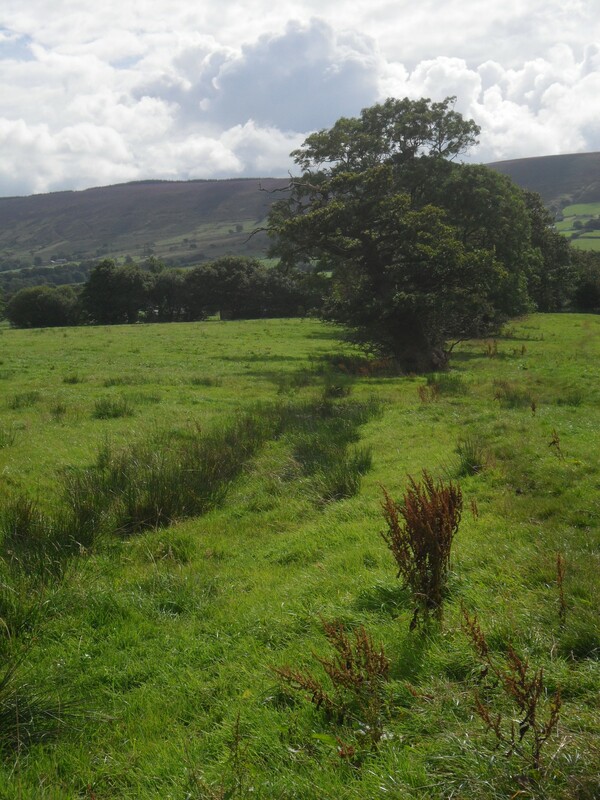 This entry was posted in Bowland Fells., Chipping Vale, Lancashire., Walking. and tagged Bowland, Chipping Vale, Flora and Fauna, Lancashire, Walking. on May 29, 2017 by bowlandclimber. Longridge Fell – better late than never. I don’t like to admit to many deadly sins, or virtues for that matter, but SLOTH was on the list today. I hadn’t got round to arranging a walk in the Lakes or in Yorkshire with friends and sloth set in whilst I was having my morning coffee back in bed. One voice said get up and going, the other persuaded me to linger listening to the radio. The morning evaporated whilst the sun shone outside. Something stirred in me and after a quick brunch I was parked up on Longridge Fell. I stopped to take a photo of rubbish dumped in the car park, picked some up later, and noticed the passenger door of the red car next to me was wide open with lots of articles on the front seat. Not daring to touch anything I closed the door and hoped no opportunistic thieves were about. I have written about Longridge Fell many times, so what was new today? Some more large chunks of trees have been felled whether because of the Ramorum fungus affecting the Larch or routine forestry work. There are forest roads which give good walking but I can’t come up here without visiting the trig. point, Spire Hill 350m. This diversion involves muddy tracks which today were semi frozen allowing one to break unexpectedly through the crust into the icy depths. Haziness over the Bowland Fells and Pendle precluded decent photography. Once I was back on the main forest track I strode out to Kemple End, I don’t normally go this far as it entails road walking back to the car but today I fancied the extra few miles. Sun glasses would have been useful against the low sun in the west. I caught up with a sprightly walker, he had been out all day having caught the bus from Preston and done a circuit of Longridge Fell and the Hodder. At the age of 75 he was out regularly and knew the Bowland area intimately, a true fell wanderer. He obviously declined my offer of a lift into Longridge. Wish I had got his name. At the end of my walk I came through the small bouldering venue of Crowshaw Quarry and I’m itching to get back on some of the problems in Spring. Talking of itching my friend John phoned me last week suggesting a trip back to Gran Canaria where we have unfinished business on the GR13. Needless to say flights are booked. PS The red car had gone – hope all OK. 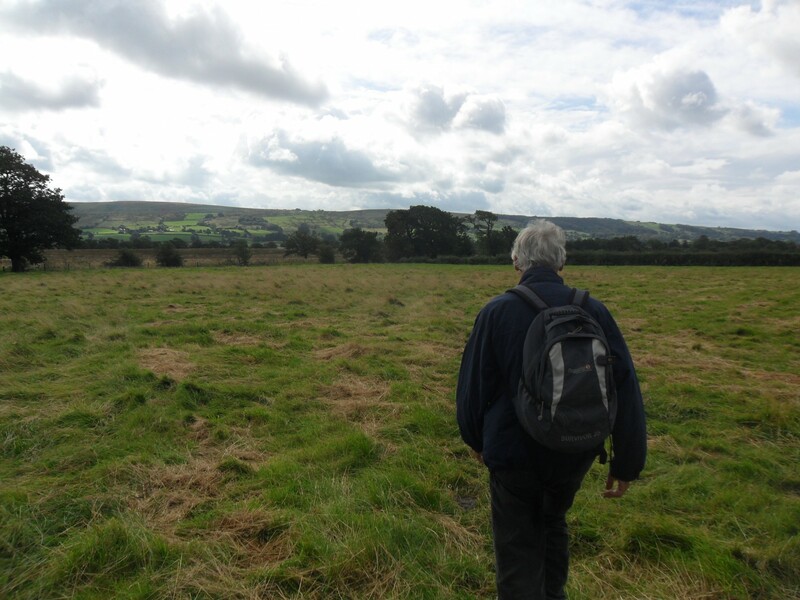 This entry was posted in Bowland Fells., Chipping Vale, Longridge Fell, Walking. and tagged Bowland, Chipping Vale, Longridge Fell, Walking. on January 20, 2016 by bowlandclimber. Croasdale – but not as we know it. I think it rained another couple of inches last night, the forecast was average and I was prepared for a lazy day to recover from my duty as a removal man. But no, Mike phoned with an improving forecast and was keen for some exercise. Where to go – all the field paths round here are waterlogged or flooded. It’s times like this when at short notice you fall back on the memory bank, “I’ll take you up Croasdale, it will be dry” . He had not been there. Getting there via Chipping wasn’t that easy with more flooding of the lanes and then land slips at Whitewell. We made it through but will come back a different way. The hills were white with snow, the lane into Croasdale more like a river and painful hailstones welcomed us. I have memories of this lane being a sheet of ice on sunny winter days when Alan and I first started exploring Bullstones as a Bouldering venue, we were super keen. But even better recollections of sunny days on the heathery hillsides watching the Hen Harriers, will they return? The Roman road was dry, despite the full streams, as was most of the fellside so that part of the plan worked. The white bollard with poems we passed reminded me of The Lancashire Witches Way, a 50 mile walk planned from Barrowford to Lancaster, maybe spring would be better. There was no bouldering today, the rocks snow covered and a freezing wind keeping us well wrapped up and moving. Following the rim of rocks I found that wonderful stone trough hewn from a boulder, Mike was impressed. Not lingering we found the tracks down to the ford but were of course confronted by a dangerous raging stream and it took us some time to find a way across to safety. A wild and exhilarating few hours. The only casualty of the day being one of my [cheap] ski sticks which I managed to snap in a slip. This entry was posted in Bouldering, Bowland Fells., Chipping Vale, Walking. and tagged Bouldering, Bowland, Bullstones., Walking. on January 11, 2016 by bowlandclimber. I’ve talked about the village of Chipping several times as I often seem to be passing through. Today I was here again for a short circular field walk that a friend was planning for his walking group. We were impressed by the tidiness of the village and the abundance of colourful floral displays, the village looked reet gradely. We didn’t spend a lot of time in the village this morning, but it is worth seeking out the stone-built cottages, 17th century school, churches, almshouses, club row and waterwheel. On the edge of the settlement we left the road and followed an old hawthorn hedge and ditch, all that remain of a Medieval ‘pale’. Line of the pale enclosure. Walking ‘beyond the pale’ with Longridge Fell in the background. We completed our simple circuit with first views to Longridge Fell and then the Fairsnape fells to the north. The route will need a few tweaks before the group use it – apparently they are not keen on too many stiles or boggy ground! 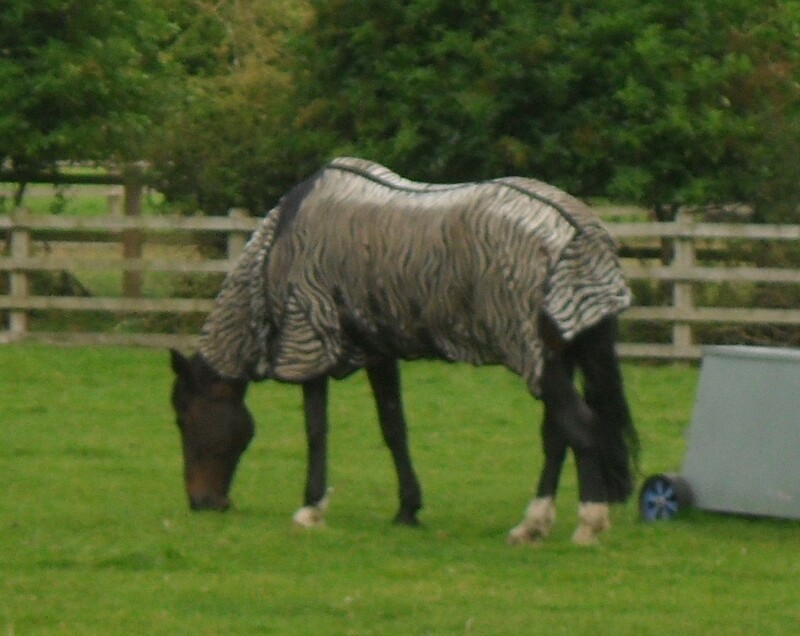 There was intermittent rain and sun and the only other point of note was a ‘Zebra’ in a field. The Tour of Britain cycle race, stage 2 on Sept 7th, comes through Chipping and has a circuitous journey on the local lanes to Longridge and beyond. Hence all the yellow bikes, what Yorkshire can do so can we. Should be worth a watch. 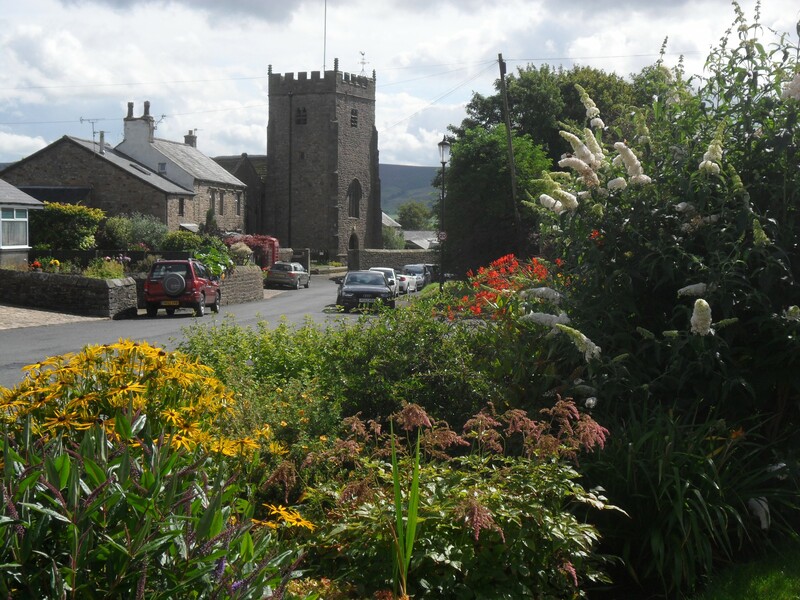 This entry was posted in Bowland Fells., Chipping Vale, Cycling, Walking. and tagged Bowland, Chipping Vale, Cycling, Walking. on August 29, 2015 by bowlandclimber.